The Comando Elite and the Turtles didn't want to fight their usual partners. Mike & Liderk escaped the match first, then Spector & Teelo. 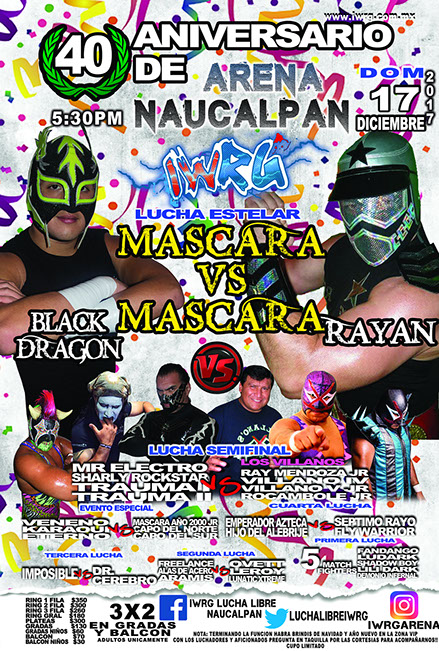 Black Dragon & Rayan will now face off in a mask match on 12/17. 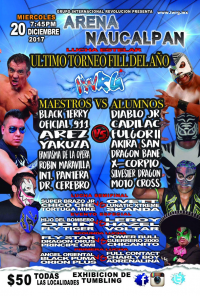 Demonio Infernal blamed and attacked Alas de Acero for losing. Dinamic Dragons fall to Comando Elite in their first defense. straight falls. 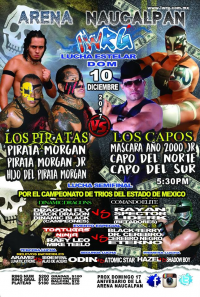 The new Capos challenged the Piratas to an apuesta match. Ludark won beat Demonio Infernal, who was upset about it and attacked her afterwards. Cerebro is still looking for a title match against Imposible. 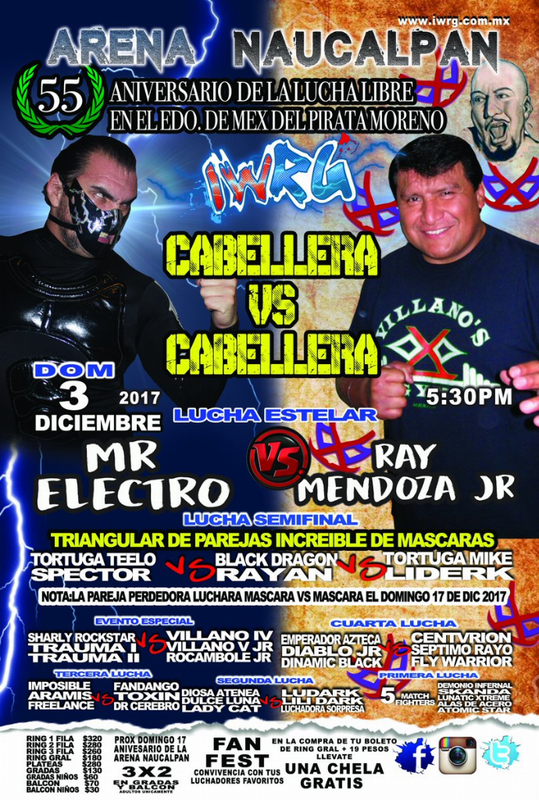 Tramuas and the Luna Brothers fought each other after the match, due to Electro hitting one of the Traumas during the match. Rayan suffered a fracture in his foot during the week and was in a cast here. He was allowed to choose between his partners Liderk & Spector for who would defend his mask for him, and picked Spector. It was a good pick: Spector pulled the shocking upset. 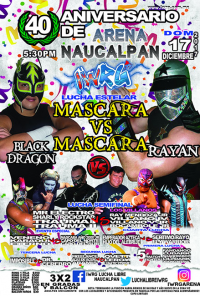 Black Dragon is Jared Anciniega Lopez from Mexico City, 18 years old, and 4 years a wrestler. Finished may have been screwed up. 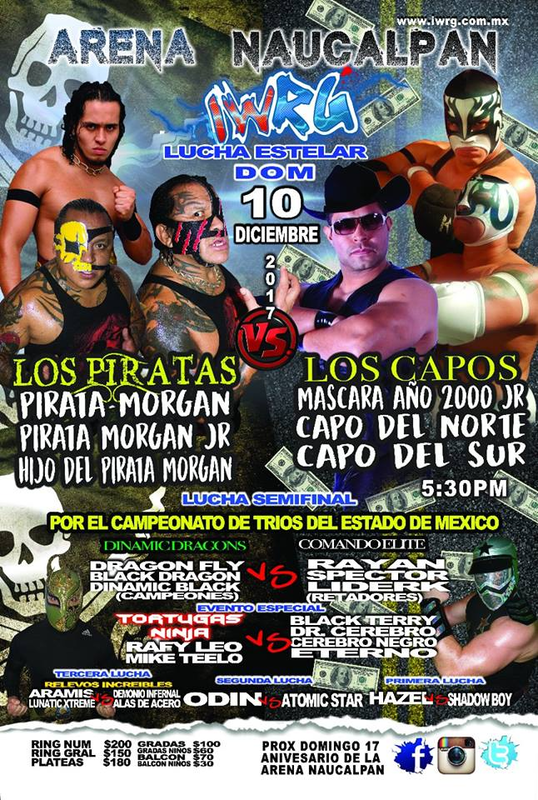 Warrior Jr. replaced Fly Star. Shio Star replaced (?) Hijo del Bombero. Chico Che ended up bleeding, and challenged Ovett to a hair match on 01/01. 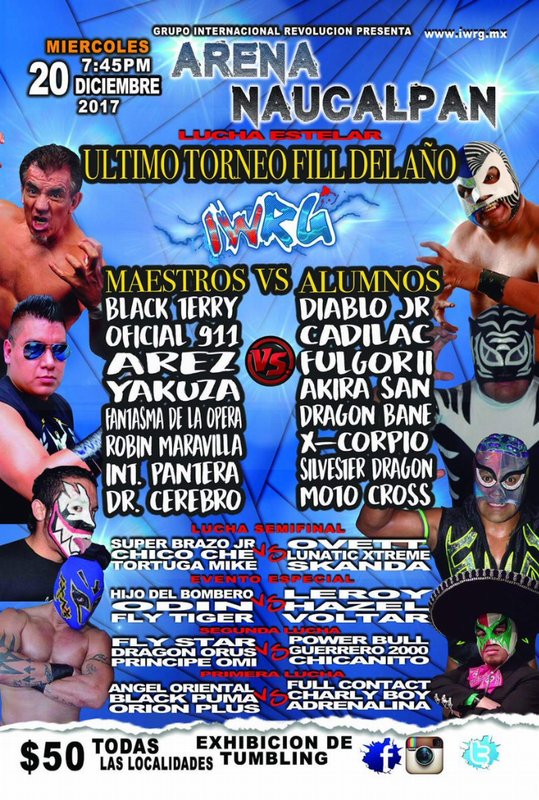 Maestros vs Alumnos; Bombero Infernal (replacing Black Terry) & Diablo Jr., Oficial 911 & Cadilac, Arez & Fulgor II, Yakuza & Akira San, Fantasma de la Opera & Dragon Bane, Robin Maravilla & X-Corpio, Internacional Pantera & Lacerado Kid (replacing Silvester Dragon), Dr. Cerebro & Moto Cross. Dragon Bane betrayed his team, and helped Fantasma beat Diablo for the win.